In much of the media’s coverage of the US midterm elections, the focus has been on the number of races won by republican candidates. When we look exclusively at races won, it appears as if the right has scored a stunning victory. The trouble is that in the American political system, power is widely distributed. An individual congressman, senator, or even governor or president can do very little to meaningfully effect policy. Consequently, when we evaluate what an election means, we need to evaluate whether enough power has been accumulated by one side or the other to meaningfully sway policy outcomes. When we do this at the federal level, we see that the balance of power has remained more or less consistent since 2010. A brief side note on the senate–there are two senate races that have not yet been decided (in Alaska and Louisiana) at the time I’m writing. For our purposes here, I’ve assumed that the democrats and republicans have split these two races, but we may find out that one of the parties took both, in which case the figures would need to be adjusted accordingly. At first glance, this looks like a pretty big move in the senate–the democrats and republicans have more or less swapped positions. But the way power is distributed in the federal government, this is not nearly as consequential as it appears. Under the constitution, the House of Representatives has sole authority to initiate legislation that allocates funds. 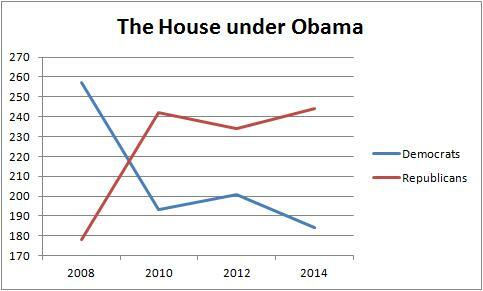 This means that since the 2010 election, the House has been able to completely shut down Obama’s legislative agenda. 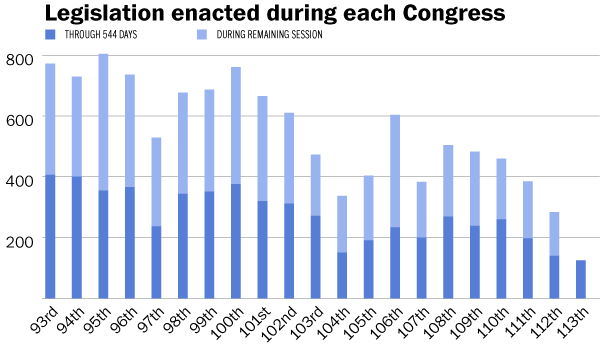 All of the administration’s major legislative acts precede the 2010 election (e.g. the stimulus package, financial reform, Obamacare). 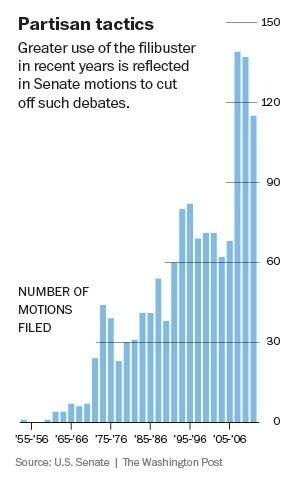 Since the 2010 midterms, the administration has been unable to enact legislation. Everything the administration wants to do, the House refuses to pass. Indeed, since the midterms, the drama in congress has revolved around the recurrent negotiation between the administration and the house over passing the budget, raising the debt limit, and avoiding the fiscal cliff and sequestration. In these contests, the House refuses to pass the budget and/or raise the debt limit unless the administration agrees to make cuts to programs the republicans don’t like, and the administration refuses to sign anything the House passes unless the House preserves funding for various government programs and includes tax hikes on wealthy citizens. The House republicans accuse the administration of fiscal irresponsibility, and the administration accuses the House of damaging the economy for political purposes. The question of who controls the senate plays no substantive role in this struggle. The House could block the administration’s legislative agenda even if democrats controlled all of the senate, and republican control of the senate confers no additional powers on the House republicans when they negotiate with the administration. As a result, the administration has been far less powerful since 2010 than it was during the first two years of Obama’s first term. Unable to pass legislation, the administration has instead tinkered with the way the executive branch enforces laws, refusing to defend the Defense of Marriage Act, imposing stricter regulatory targets for coal power plants, urging the FCC to reclassify the internet as a utility to protect net neutrality, and so on. These changes are not insubstantial, but without the legislative power they are limited in what they can achieve and subject to potential judicial scrutiny. Since the House remains in republican hands and the presidency remains in Barack Obama’s hands, we should expect all of this to continue just as it has before. The president will fight with the house about the budget, and the president will continue to use executive authority to advance his agenda. The administration will have roughly the same amount of power it has had since 2010. This rule change only applied to presidential appointments, not to bills or laws, so it will not allow senate republicans to pass legislation over filibusters, much less vetoes. It is true that now that the republicans have a majority in the senate, they can block appointments without having to use the filibuster, but the rule change was only made a year ago. 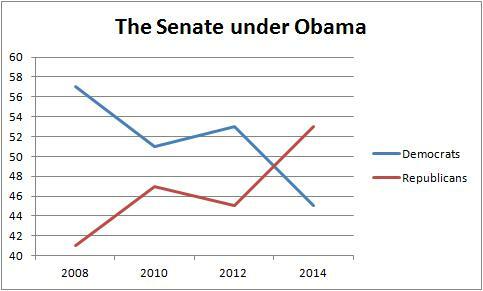 From the 2010 midterms until November 2013, senate republicans were already able to block appointments. The administration will likely attempt to counter with the same strategy it used prior to November of last year–making recess appointments wherever possible. Senate republicans will likely respond by once again holding pro forma sessions to prevent the president from declaring the senate to be in recess. The Supreme Court recently ruled that the senate is constitutionally entitled to do this. The upshot of all of this is that the republicans in the senate will be just as powerful with respect to appointments as they were between the 2010 midterms and November 2013. Yet this has not stopped the American public from once again electing a set of politicians that will, from a policy standpoint, behave exactly the same as those that have gone before.